What is Early Intervention? What is Special Instruction? What is Early Intervention? What Is Special Instruction? I get asked one of these everyday. This is the first part of a series diving into the answer to that question using the Division of Early Childhood Position Statement as reference. The Division of Early Childhood is a major professional association for Early Intervention Special Education including special instructors. According to the DEC Position statement on Special Instruction, “The Role of Special Instruction in Early Intervention,” special instruction includes four things. The designing of learning environments and activities that promote the child’s acquisition of skills in a variety of developmental areas including cognitive processes and social interactions. Curriculum planning including the planned interaction of personnel, materials, and time and space, that leads to achieving outcomes in the child’s individualized family service plan. 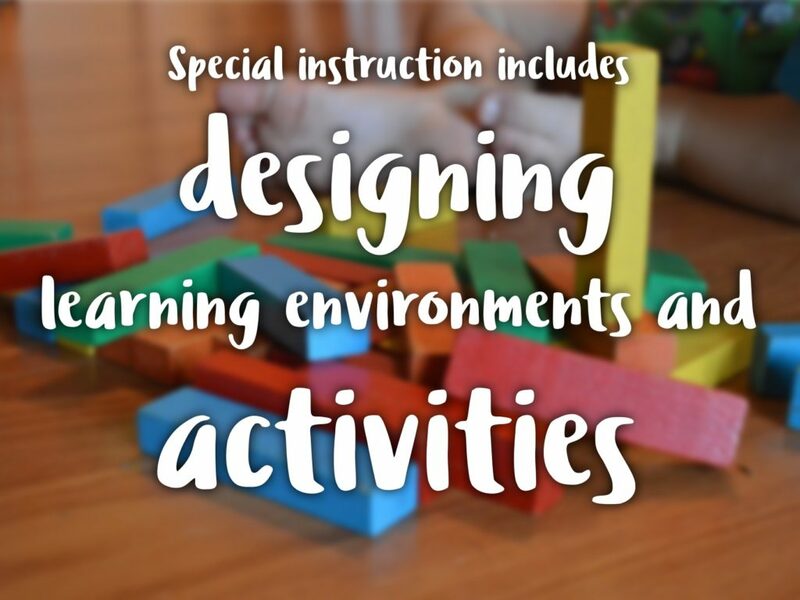 Special Instruction includes the designing of learning environments and activities that promote the child’s acquisition of skills. In my early intervention experiences, designing a learning environment includes showing parents or teachers how to use what they have to teach a target skill. A learning environment can include people, things, AND routines. When a child has a language delay, her learning environment needs to include language. Similarly, when a child has a social delay, her environment needs to include social interactions. Same for physical, adaptive and so on. For example, when a child is working on cruising, she needs furniture to cruise on. I am always surprised how hard this one can be to improvise! Sometimes we need to take dangerous or distracting things out of the environment (tv or breakable no-no’s) so the child is free to explore. Working with the adults in the child’s world is an effective way of designing a learning environment. Designing learning activities… My favorite! I have books and toys and entire Pinterest boards dedicated to that. Designing a learning activity is more than the “stuff.” It includes the reciprocal interactions with the teacher too! This entire blog is pretty much dedicated to really getting into this pretty deep. There is just so much we could say here! I can’t wait to see what this turns into! Posted in Special Instruction in Early Intervention, What is special instruction?